What the title says. Seems the developers grew annoyed with this too and added that check in BFME2 and ROTWK. Doesn't work in BFME1. in the game's base directory and it won't ask for confirmation anymore. 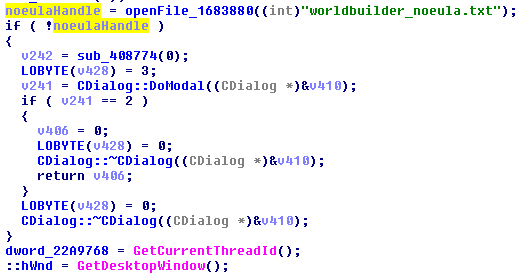 Be sure the file is actually called worldbuilder_noeula.txt and not worldbuilder_noeula.txt.txt because you have extensions disabled by Windows default. This is a good timesaver as I work with adding in new models for AotR all the time and being able to test them quickly and not waiting for Worldbuilder is fantastic. All this time and I never knew this! Shame it doesn't work for BFME 1, but its still a great timesaver for ROTWK. Just out of curiosity how did you discover this? Cheers withmorten. Created the file, and the popup was no more, without modifying the binary. If you're really, really annoyed by the BFME1 worldbuilder popup, I think I already created a patched version of it that I could send you. If I could actually get it to run one of these days again I could check ... keeps giving me that "access violation" error. Edited by withmorten, 13 November 2017 - 04:32 PM.